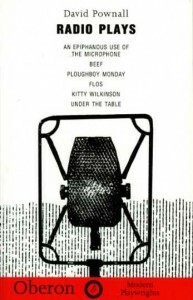 An Epiphanous Use of the Microphone was commissioned by the BBC for the 75th anniversary celebrations of BBC Radio drama and broadcast in May 1998. This and five previously unpublished David Pownall radio plays, each an award-winner, make up a compilation of some of this country’s finest radio plays. Also includes the plays Beef, Floss, Ploughboy Monday, Under the Table,and Kitty Wilkinson.